September 4, 2016 4 CommentsBy Adilia S.
Ukrainian capital Kiev offers numerous places of attraction. Besides, it is one of the cheapest cities in Europe for foreign tourists. But that doesn’t make Kiev less exciting. Moreover, residents of the USA and European Union don’t need visas to visit Ukraine. Simply book your plain tickets and hotel online. 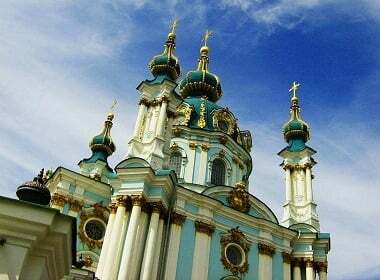 You may enjoy a vacation in Kiev in a just few days! Have you been chatting to Ukrainians girls online? Might be it’s time to move your relationship to the real world. Women from Ukraine would love to show you their home country. Ladies from other Ukrainian towns will join you in Kiev with pleasure. It’s the perfect place for romantic trips and getting to know each other in the atmosphere of a magnificent and historically rich city. Let us show you 10 wonderful places to enjoy. Once you’ve arrived and met your beautiful girl, don’t be in a hurry to visit the famous sights of the Ukrainian capital. 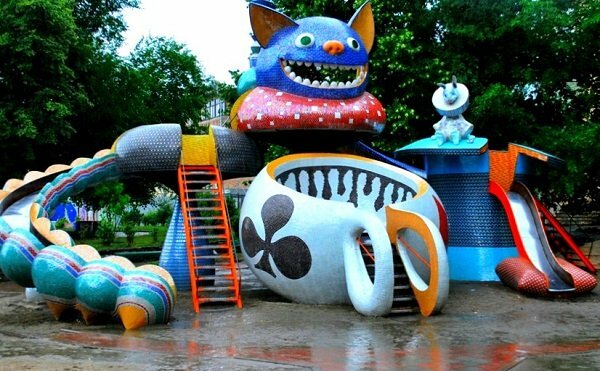 Have a cup of delicious coffee in one of the best Kiev’s coffee shops called Zolotoy Dukat. It has a great selection of coffees, desserts, and chocolates. Beautiful interiors with stylish wooden furniture make it a nice place for your morning coffee in the city center. Enjoy your cappuccino or espresso while discussing the sights to see during the day. Luckily, the cafe is not far from the Kiev’s main square, where all the tourists go first. 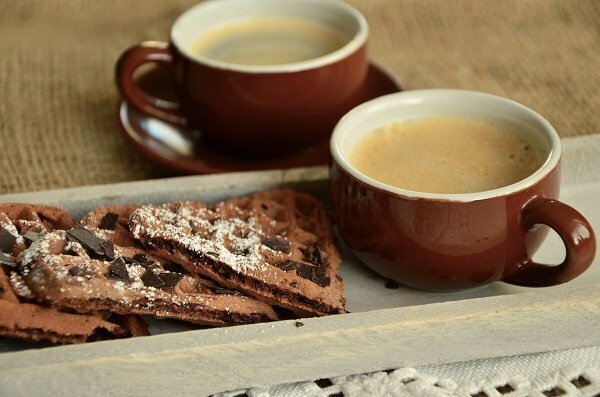 Before going sightseeing, enjoy a cup of coffee in the famous central café. Kiev’s main square is called Maidan Nezalezhnosti or just Maidan. It’s translated as Independence Square. 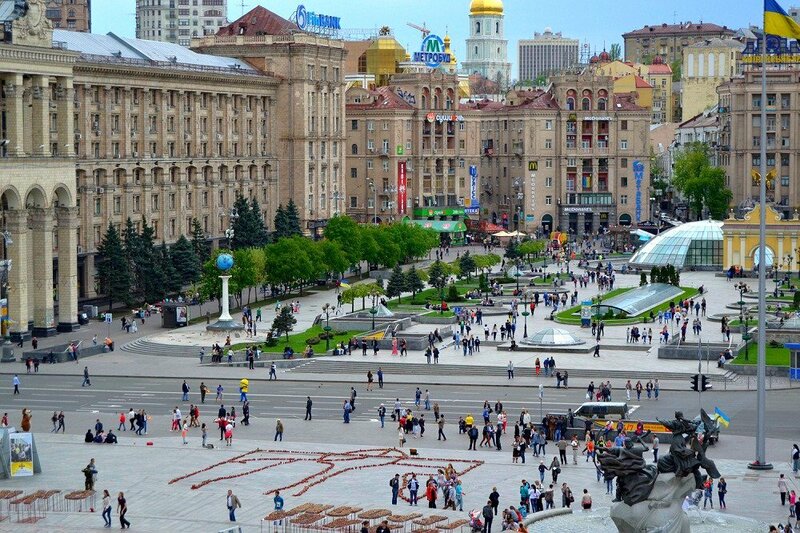 Every day Maidan attracts lots of city guests and travellers from all over the world. The first monument you see there is the Independence Column. It’s a tall monument with the figure of a girl in the Ukrainian national costume on the top. The girl has a branch of guilder rose in her arms. The statue has become the symbol of Independent Ukraine. The area around the column is decorated with six fountains and an artificial waterfall, which is used as mini-beach during hot days. Locals love walking barefoot along the running water of the waterfall. Maidan Nezalezhnosti attracts lots of city guests every day. From the right side of the Independence statue, you can see 6 beautiful fountains. The most unusual one is designed in the form of a dandelion spraying millions of water droplets. Next to the dandelion you will find a bronze monument to Cossack Mamay, which is quite popular among tourists. The secret is in Mamay’s horse. Travelers like to climb on the horse and take funny photos. To the left from the Independence Column you’ll see the monument dedicated to Kiev’s founders: Kyi, Schek, Horiv, and their sister Lybid. According to the ancient myths, they established the medieval city of Kyiv. 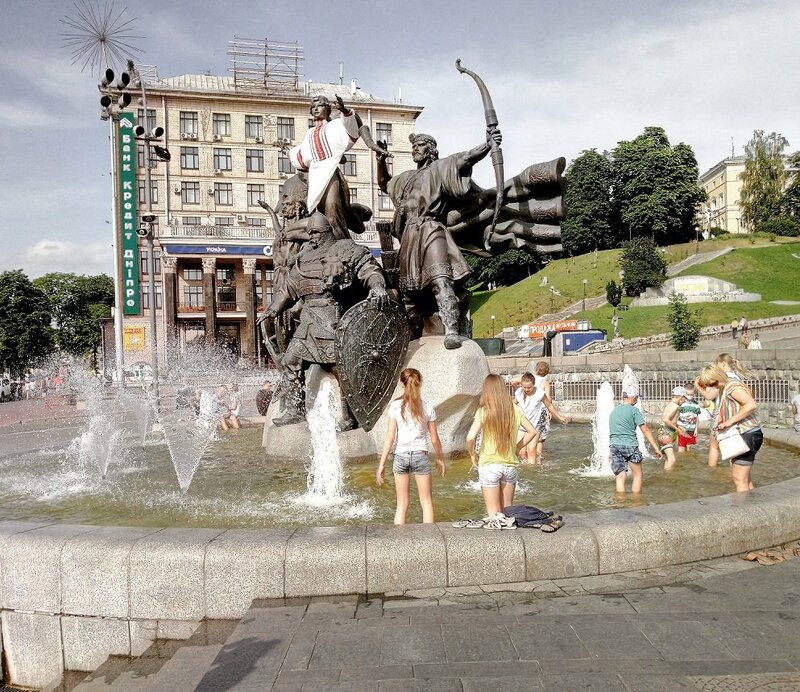 The monument to the founders of Kiev becomes the center of mini-beach during hot days. Go along the alley of fountains and you’ll get to a big arch with an angel at the top. It’s the ancient gates of Kyiv — Lyadski gates. To get a panoramic view of the square, go up to the International center for arts and culture. Enjoy the panoramic view of the central square and take pictures to remember. If you’re fond of shopping, visit the underground trading center called Globus, which lies beneath the square. The glass domes are the parts of the underground mall’s roof. The Independence Column (the tall pillar to the left) is situated in the center of Maidan. 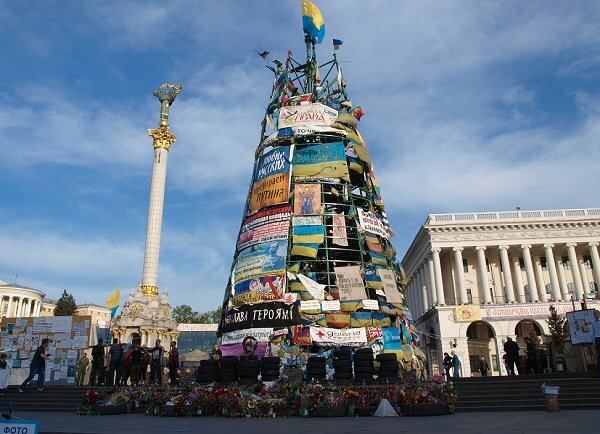 In the centre of this photo you see the “Revolution Christmas Tree” that was the symbol of Ukrainian’s fight for freedom during the Revolution of Dignity (Nov. 2013-Feb.2014). It’s no longer there. 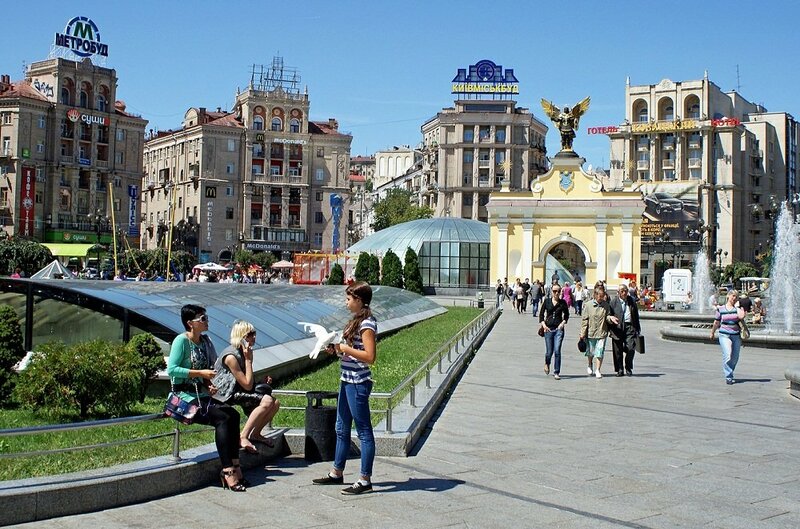 Khreshchatyk is the capital’s central street and the heart of business life. The main avenue crosses the Independence square, so you don’t have to look for it. During holidays and weekends, the avenue is closed for traffic and becomes a wide pedestrian area. Naturally, the best time to go there is during weekends. There you will find numerous boutiques, souvenir shops, cafes, and restaurants. Apart from that Khreshchatyk contains the central post office, the National Philharmonic Orchestra of Ukraine, and the city council building. Tickets to a concert cost about 70-300 hryvnia (USD $3-12). The boulevard stretches up to Bessarabsky Bazaar where you can try fresh local vegetables and fruit while talking to local “babushkas” (grannies). They are kind-hearted and really talkative, if you can manage a couple of world in Russian or Ukrainian. Khreshchatyk Boulevard is the metropolis’ main street full of small and big shops, restaurants, cafes and administrative buildings. Andriyivskyy descent is an incredibly picturesque street. It’s a unique ancient street which is loved by craftsmen, antique dealers, and artists. Admire the works of local artists and visit city’s famous museums, galleries, and antique shops. Almost all the buildings used to belong to famous writers, sculptors, musicians, and scientists. The street is absolutely marvelous and its historical buildings fill you with a special atmosphere of Kiev’s cultural life. Andriyivskyy Descent is the center of the capital’s cultural life. 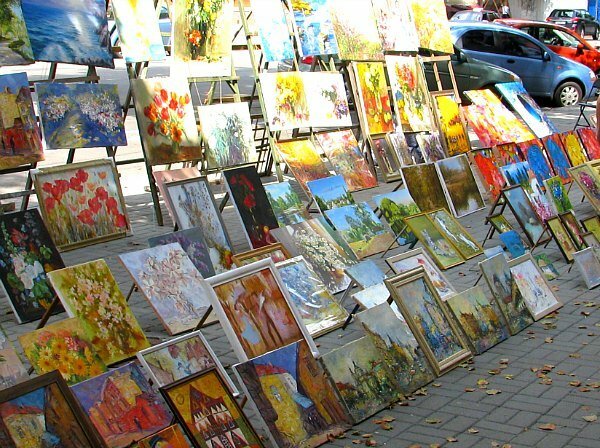 Buy beautiful paintings and other craftworks by local artists, as well as souvenirs. 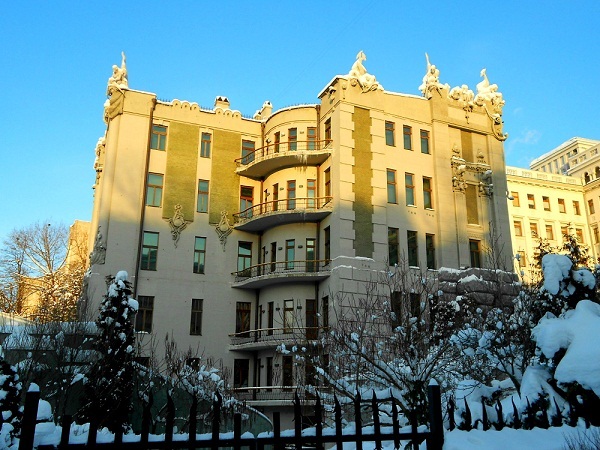 All the buildings of Andreevsky Spusk used to belong to someone famous. Have a spare hour? Visit Bulgakov’s museum. Bulgakov is a famous Russian writer who was born and lived in Kiev. The tickets are available inside the museum. It is open daily from 10 am to 5 pm. 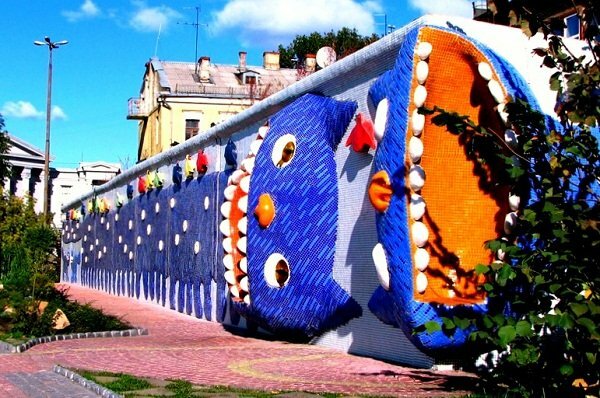 Or go to the One street museum, which is dedicated to Andriyivskyy descent. Find out more about the mysteries of the street and have a look at a broad collection of postcards, photos, manuscripts, documents associated with the descent. A guided tour of the museum costs around 200 hryvnia ($8). On top of the street you’ll notice the beautiful St. Andrew’s Church built in the Baroque style. It is now a working temple and a museum showcasing magnificent paintings, sculptures, and interiors. The museum is open from 1 pm to 5 pm and closed on Wednesdays. St. Andrew’s Church can be found at the top of the street. 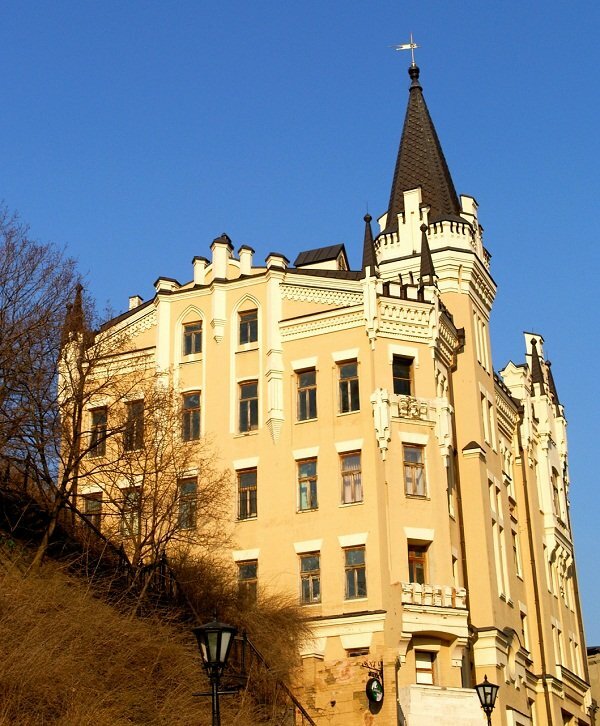 One place you cannot miss on the Andriyivskyy Descent is the Castle of Richard the Lionheart. It’s a metaphoric name for the most mysterious construction of the descent. It was built in a neo-gothic style and no family could survive there. No one has been residing in the castle for decades. People believe that some evil spirits live there. The building was resold several times. The inhabitants used to tell that they heard sounds of crying children and some mysterious footsteps. Call it a ghost house, if you wish. Historian Stepan V. Golubev, who also used to live there, was so tired of the terrible sounds that he decided to check the chimney. Unbelievably, there was an eggshell, which was resonating when the wind was blowing through it. This seemed to be the reason of the infamous terrible sounds. However, the residence is still empty. Lots of curious people dream to get there but it’s closed and the building’s condition may be unsound. It definitely needs a reconstruction. While going along this beautiful street, pay attention to this prominent building and discuss this amazing story with your girl. Maybe she knows more details associated with the Richard’s house. The history of Richard’s house is full of mysterious legends and myths. After viewing the mysterious building, pump up your excursion with positive and romantic impressions. Go through the yard of the house #28 on Andriyivskyy Descent, and you will find yourself in a marvellous alley. It’s an ideal place for dates and few tourists know about this place. 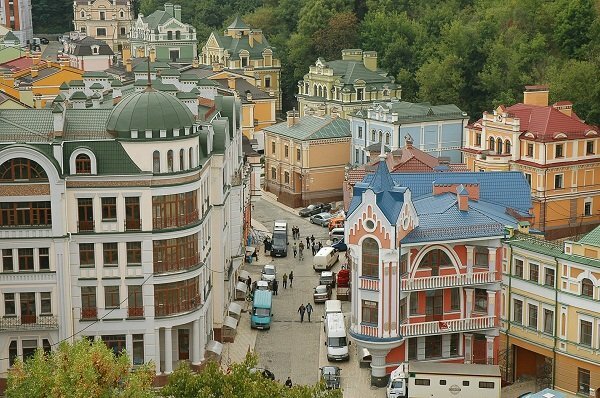 Admire the panoramic view of Kiev’s hills and enjoy secret hugs with your sweetheart. Go up from the hidden passage of lovers and you’ll see another alley. It is one of the most favorite spots of city guests. People love it. Not because it is filled with sculptures of some strange and unrealistic creatures but also because it makes you feel like a kid in a fairy tale. By the way, don’t forget to take photos! The alley is popular among students, little children, and people of all ages. The sculptures of the landscape valley are incredibly fun. It is the oldest and one of the main Orthodox complexes in the world. It was founded as the caves monastery in 1051. The founders of the monastery and their followers built underground passages and spent many hours praying in caves. When they died, their bodies were naturally preserved inside the caves thanks to low temperatures and dry atmosphere. Pilgrims from all over the world come to this sacred place each year. Today visitors can witness about 120 relics of the saints in the caves. The territory contains several lovely churches and an underground cave system. Try to avoid visiting Lavra on weekends when it gets extremely busy. If you need a guided tour, go to the excursion bureau from the left side of the main entrance. It costs around 500 hryvnia ($12) per group of up to 10 people. 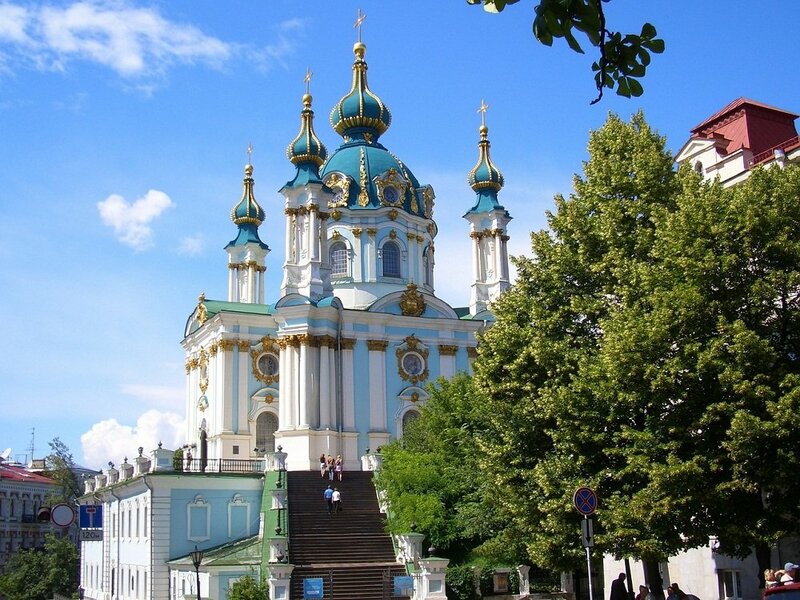 Kiev-Pechersk Lavra is one of the main Orthodox complexes in the world. 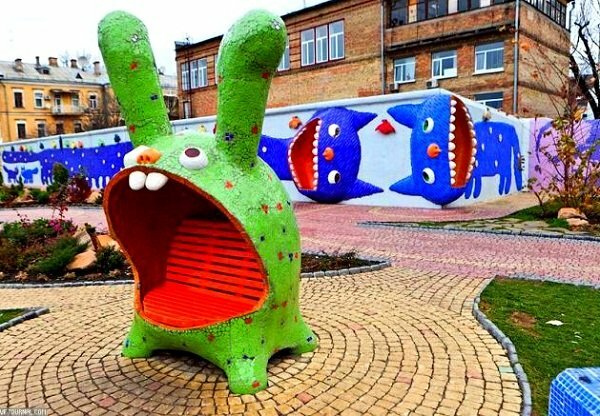 It’s one of the weirdest and popular buildings of Kiev. It was constructed by Polish architect Vladislav Gorodetsky. He had an outstanding personality, which was reflected in many of his works. The structure is decorated with numerous mystical and fantastic creatures like mermaids, frogs, dolphins, and eagles. The story of the building is entailed in legends. Some of them insist that the architect constructed it in the memory of his daughter, who drowned. Another story holds that Gorodetsky made a bet that he would build the house out of cement (a new material at these times) in 2 years. Gorodetsky’s goal was to create a masterpiece that would survive centuries. Now the house is used as the presidential residence. Excursions to see what’s inside are available only on Saturdays but you have to book in advance, as there are many tourists dreaming to visit. Usually people wait for about 1 month in hopes to explore this unusual place of interest. House with chimaeras looks unusual and stands out from the local buildings. The building serves as the residence of the Ukrainian president. You can’t leave Kiev without experiencing its nightlife. The vibrant centre has plenty of nightclubs. One of the best clubs is the 4-storey entertainment venue called D*lux. It’s a luxurious and spacious place famous for a good musical mix and stunning girls. Apart from the dance club, it also has a restaurant with an outdoor terrace. Before going there, check the dress code or you may be not allowed to enter. The website of Dlux.com.ua showcases recent club events. Kyiv is definitely a green capital of Ukraine. It has dozens of beautiful parks and gardens. However, Khreshchatyk park is probably the easiest to reach. Perhaps, that’s why it became so popular among visitors. 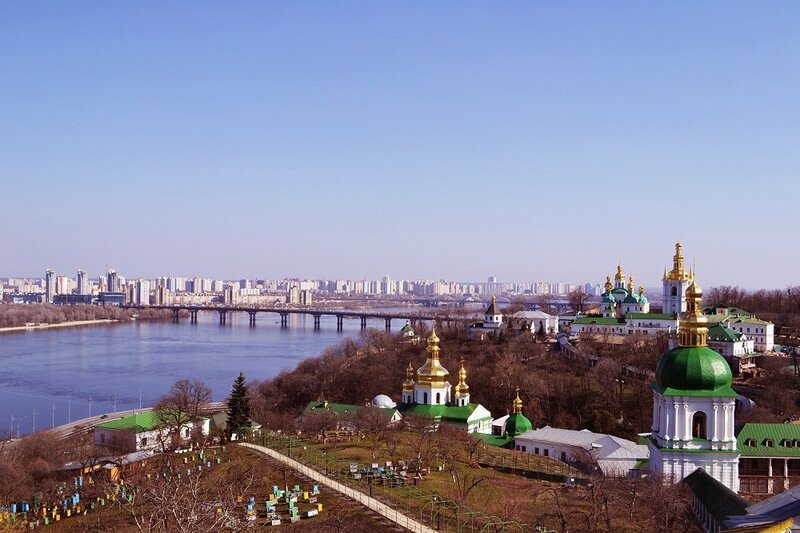 Located at the northern end of the city’s main street, it offers a spectacular view to the Dnipro river. It also has several architectural landmarks, like the gorgeous building of Academic Puppet Theater and the Lover’s Bridge, loved by newlywed couples. Have a picnic or simply relax on the bench or go for a walk along the river bank. 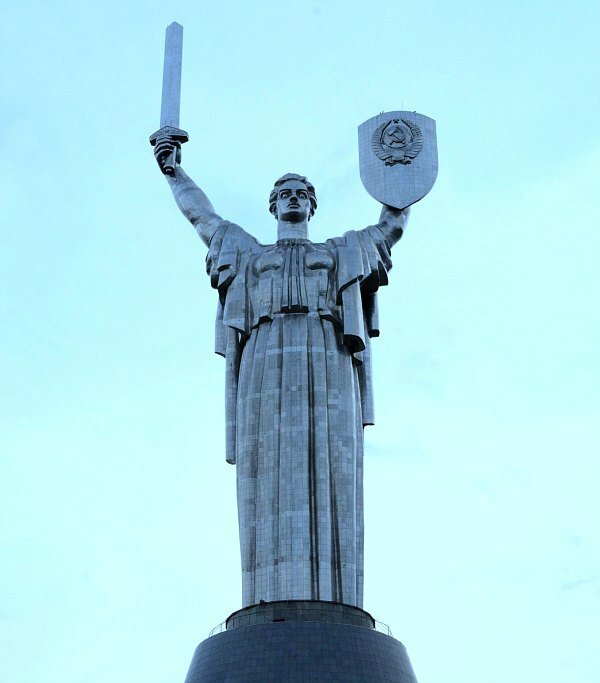 The statue of “Rodina Mat” (Mother Motherland) towers over Kiev. It’s visible from miles away. 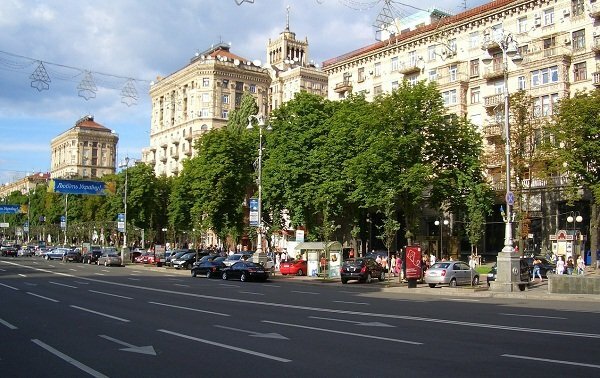 My favorite place in Kiev is Khreshchatyk Boulevard. There are a lot of stores, green trees, cafes, shopping mall Globus and McDonald of course. 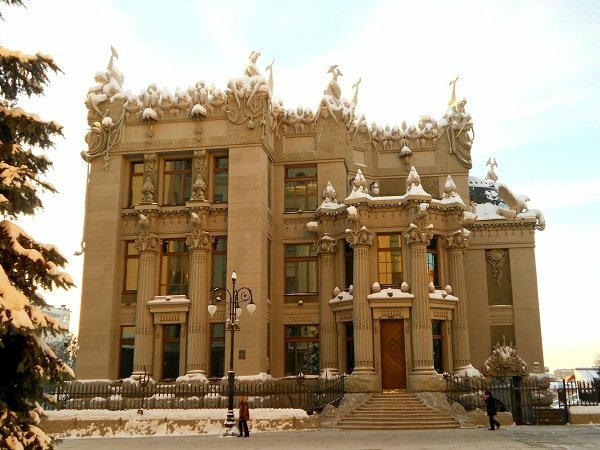 I live in Ukraine but still didnt see house with chimaeras. I heard its beautiful building with weird characters on the top. I would love to visit Ukraine one day. I think it is such a beautiful country. So much to see there. I want to study Ukrainian so that I will be able to understand the culture better and meet new people. I have a few relatives who are originally from there. I really like Kiev, with my favorite place being Maidan Nezalezhnosti. The city was so impressive and beautiful, I took about 125 photos in the 24 hours I was there. I was passing through on my way to visit a girl in Poltava. I would definitely like to visit again. Oh, I visit Kyiv every month for my work. It is a very old and beautiful city. 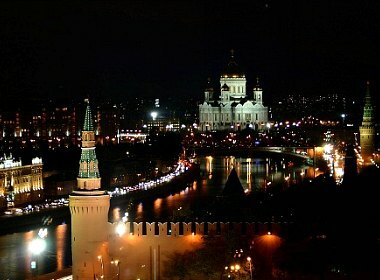 My favorite place is Saint Sophia’s Cathedral. But about the landscape alley I didn’t know and I will try to visit it next time. Its very bright and interesting place for creative people.